Home > Blog > An Epic Holiday World Halloween Achievement "I did that. 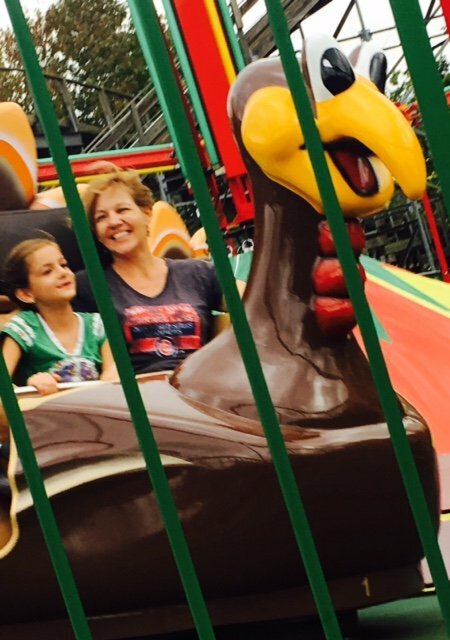 I rode the Thunderbird." An Epic Holiday World Halloween Achievement "I did that. I rode the Thunderbird." Her eyebrows wrinkled upward dramatically as she cracked a goofy, nervous smile. Seven-year-old Daisy was about to ride the smallest roller coaster at Holiday World: The Howler. If only she could have known then how far her courage would grow by the end of our day. Holiday World visits have become an annual tradition, usually with friends tagging along. This year, instead of taking five kids down to the Southern Indiana theme park by myself as I have for the past few years, we made the trip with a two-adults-to-five-kids ratio – a welcome change! Our group did so well together I wanted to cry with gratitude. It ended up being a simply amazing, easy, super-fun day filled with laughs, friendship and surprises. I love going in October for Halloween Weekends when lines are shorter and everything is covered in fall décor. At this time of year they also have extra fall attractions like a corn maze, hayrides and trick-or-treating – if you can tear your kiddos away from the rides. As our day unfolded the older kids kept lining up to climb on the wildest rides (Legend, Voyage, Raven, Mayflower, Raging Rapids and Liberty Launch). Daisy mostly hung back with an adult, looking for milder thrills (Reindeer Games, Gobbler Getaway). As we walked through the Thanksgiving section of the park, Daisy was brave enough to go on the Turkey Twirl with me. It looked pretty basic, but I was kind of shocked by how much centrifugal force was involved when those turkeys started spinning. It took everything I had not to let curse words fly out of my shocked mouth between laughs. Our whole day was building up to the attraction that everyone in our group except for Daisy was dying to ride: The Thunderbird. It’s a steel roller coaster that you ride with your feet dangling below you. The Thunderbird launches you from zero to 60 miles per hour in 3.5 seconds, then takes you on a heart-pounding ride filled with twists, turns and the tallest vertical loop on any “wing coaster” in existence. It is super fun – and INTENSE. Rain showers started just as we approached the ride, so Daisy stood with all of us in line under cover until we reached the front. We stepped aside and watched everyone else climb on board and launch. I watched the gears spinning in her little head. “I think I want to ride it,” she told me. I didn’t believe her. But as the rest of our group got in line to go for a second time, she grabbed Clara’s hand and got in line too. As the two of them got strapped in and ready for launch, we adults tried to keep smiles on our faces as we saw Daisy starting to get nervous. She had tears starting to drip from her eyes as they left the platform. I was powerless to help. She finally caught her breath and looked back at the towering ride. Holiday World, in Santa Claus, Ind., is hosting Halloween Weekends on Saturdays and Sundays through October 29. A Pirate’s Adventure at ZooBoo!